-refried beans (frijoles refritos), or queso con loroco (loroco is a vine flower bud from Central America). 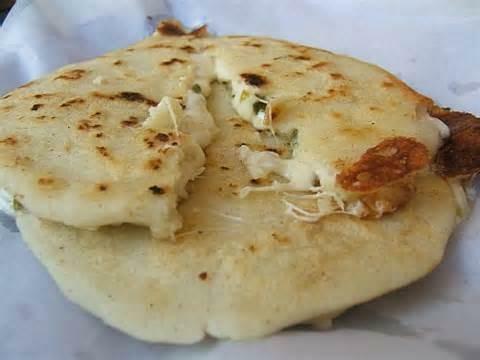 The two most common pupusas are the pupusa de quesillo (cheese) and more popular pupusa revuelta with mixed ingredients of cheese, beans, and chicharrón. Pupusas are typically served with curtido (lightly fermented cabbage slaw with red chilies and vinegar). On 1 April 2005, the Salvadoran Legislative Assembly declared pupusas as the national dish of El Salvador and every second Sunday of November would be National Pupusa Day."